This Spider is one of just 648 Solihull factory Spider Special Edition fuel injected cars, equipped with a Bosch fuel injection system for the CA market. I have owned this TR7 since 1989. It is currently registered in California and has a current smog certificate, last smog test July 2017. It had steel wheels when I bought it and I do not have the alloy wheels. In the mid 90s I replaced all the rubber bushings with polyurethane and replaced the springs on all four corners. In 2007 the engine was rebuilt and a new engine block was installed with new pistons, rings, bearings, and crankshaft. The car is sound. It needs a new top. The seats have covers on them. There is a small area of superficial rust on the right rear quarter panel. It needs typical minor body work and a paint job would be nice. It has been very reliable for me over the years. I have a number of spare parts of various descriptions. For Sale many NOS, new and unique parts for TR3 and TR6 (too many to list if you need / want a part lest me know): Including a complete Petrol Injection for a TR6, Complete Judson Supercharger for a TR3 (still in original box), new Aluminum head for a TR3 (Moss part #853-048), new Brooklands windscreens (Moss part #224-100), etc. Selling parts individually for best reasonable offer. Advertising is free to TTSCC members selling Triumphs, in whole or parts, within the State of California. For advertisers who dont meet these qualifications, the rate is $20. Classified ads are printed for 3 issues (3 months) and must be received by the 15th of the month. Make checks payable to TTSCC and remit with your ad, along with your name, mailing address (for a copy of the newsletter) and telephone number. 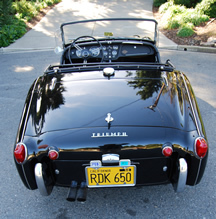 Send ads to Triumph Travelers Sports Car Club, P.O. Box 60314, Sunnyvale, CA 94088-0314.